Your choice of Pepperlane Preserves. We used Raz-Pepper. In a large bowl, beat butter and cream cheese at medium-high speed with a mixer until creamy. Add sugar, vanilla, and almond extract, beating until fluffy. Add egg, beating just until combined. In a medium bowl, combine flour and ground almonds. Gradually add the butter mixture, beating just until combined. On lightly floured surface, roll out dough to 1/8-inch thickness. Using a 2 ½ inch heart-shaped cutter, cut 48 hearts from dough, rerolling scraps as needed. 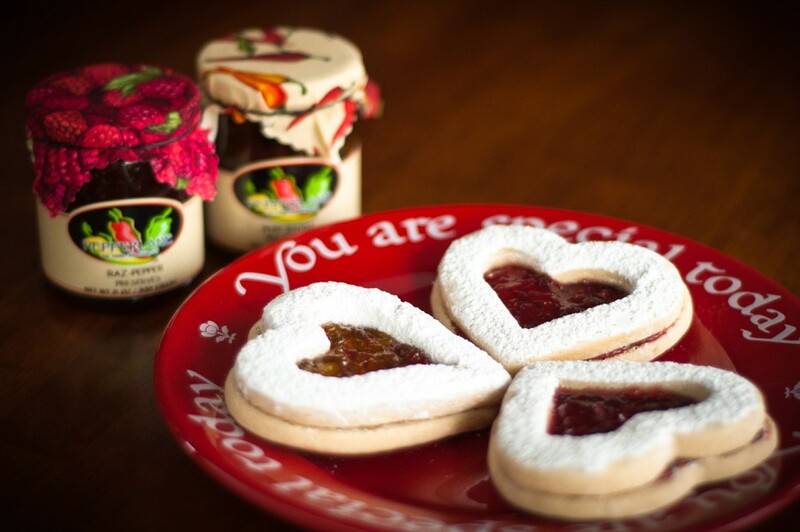 Using a 2-inch heart-shaped cutter, cut out centers of half of cookies. Place cookies on prepared baking sheets, and bake for 10 to 12 minutes. Spread a thin layer of preserves over flat sides of whole cookies. Sift confectioners’ sugar over cookies with cutout centers, and place over whole cookies to make sandwiches.